Attention: Our shoe size is standard, please choose it according to your own size and do not refer to the reviews. Ofoot is our company's free brand which registered in the United States and the European Union.It includes slippers, animal shoes,indoor snow boots,knitted socks and other knitwear suit for adults or children.We aim to provide beautiful, durable and high quality slippers and other knitwear, ensure the products for skin irritation.Our high quality slippers are a perfect match for your bathrobes! Why Choose Our Cotton Memory Foam Slippers? ★ The upper and lining material is thick and comfortable which can dry and free your feet. ★ The slippers have soft skid-resistant TPR sole.It is innocuity and do no harm to any floor surfaces including wood, tile, viny. What's more? It would not make any noise when you walking in the bedroom. ★ Hand or machine washable. 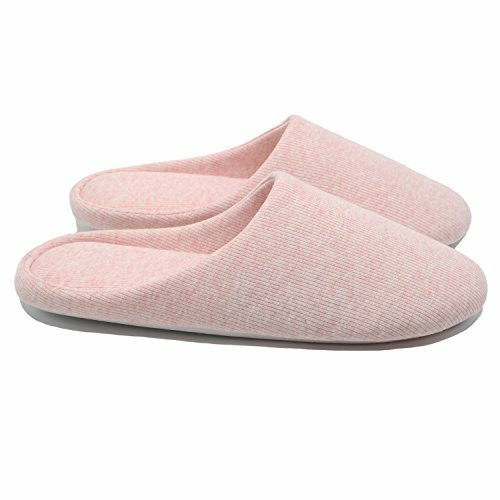 ★These slippers are extremely comfortable, durable and anti-slip, you can wear it at home, at a spa, in hotel, traveling, or indoor activities. ★These slippers are suitable for all seasons, especially better in spring, autumn and winter. ★ 100% no risk money-back guarantee. Size S(suit for US 5-6, UK 3-4, EU 36-37, CM 22-23). Size M(suit for US 7-8, UK 5-6, EU 38-39, CM 24-25). Size L(suit for US 9-10, UK 7-8, EU 40-41, CM 26-27). Size XL(suit for US 11-12, UK 9-10, EU 42-44, CM 28-29). We guess you will get a surprise when you receive the slippers, for its design, quality and package. Don't hesitate to choose it and we trust it will great fit for you. PERFECT AFTER-SALE SERVICE: WASHING INSTRUCTIONS:Handwash Only,No Tumbledry,No Iron, No Bleach, Natural Air Drying. 100% no risk money-back guarantee if you are not satisfied with your purchase. Just contact us and we will give you the most satisfactory solution. If you have any questions about this product by Ofoot, contact us by completing and submitting the form below. If you are looking for a specif part number, please include it with your message.